MIT’s tradition of national service is broad, deep, and very much in the present tense. Examples range from MIT’s pivotal role in developing radar during World War II, to today’s pioneering defense and security research. On campus and at MIT’s Lincoln Laboratory, MIT’s research enterprise, including at our Institute for Soldier Nanotechnology, is essential in our work to serve the nation and the world. 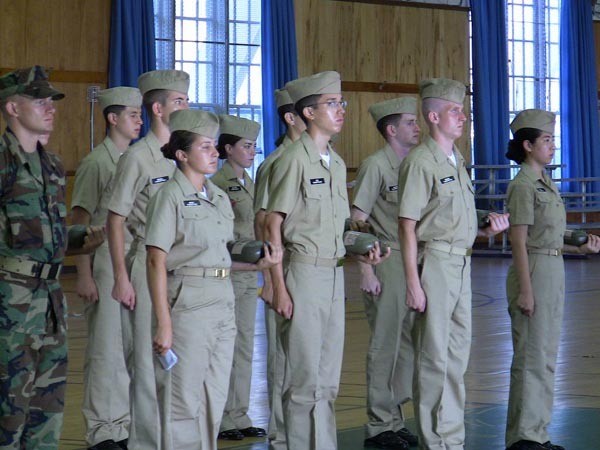 MIT’s national service also takes the form of innovative educational programs, like our premier naval programs in Mechanical Engineering and our Lincoln Beaver Works Center. And it includes the service of dozens of senior military leaders and thousands of officers, across all branches of the service, who have been commissioned out of MIT. At the same time, as an institution whose success depends on an openness to talent, MIT is profoundly committed to equal opportunity for all our students, including our transgender students. As MIT’s nondiscrimination policy notes, the ROTC programs at MIT are operated under Department of Defense (DOD) policies and regulations, and do not comply fully with MIT’s policy of nondiscrimination with regard to gender identity. The August 25th directive reminds us that we need to continue to advocate for a change in DOD policies and regulations concerning gender identity, and I can reaffirm MIT’s ongoing commitment to replace scholarships for students who lose ROTC financial aid because of these DOD policies and regulations. To fulfill our potential as individuals and as an institution, we must ensure that our labs and classrooms remain open to all with the talents and passion to help us succeed. In 1996, with the passage of ‘Don’t Ask, Don’t Tell,’ we faced a similar clash between our commitment to national service, and our commitment to strive for fairness and equal treatment for all our students. In the face of the new ban on transgender people serving in the military, we will do now what we did then: We will seek ways to ensure that every MIT student interested in ROTC has a chance to complete every educational aspect of the program. Upon graduation, transgender cadets and midshipmen might be denied military commissions due to the recent ban; we cannot control that. But we will always aim to ensure that this educational opportunity is available to every student who wishes to be part of it, including covering any loss of a DOD scholarship because of the new policy. The MIT community is proud of those members of our community who have committed to serving our nation through the Institute’s ROTC programs, and we look forward to working with DOD to find a path that provides all individuals the opportunity to serve our nation with dignity.